Mirror angle can be adjusted. 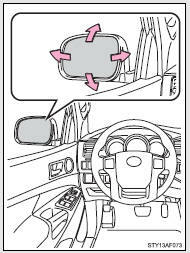 Adjust the mirror up, down, in or out using the switch. 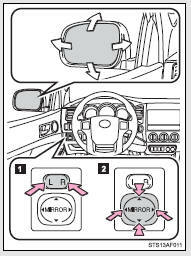 Adjust the mirror up, down, in or out by pushing the mirror surface. Push backward to fold the mirrors. The engine switch is in the ACC or ON position. Failing to do so may result in loss of control of the vehicle and cause an accident, resulting in death or serious injury. ●Do not drive with the mirrors folded back.